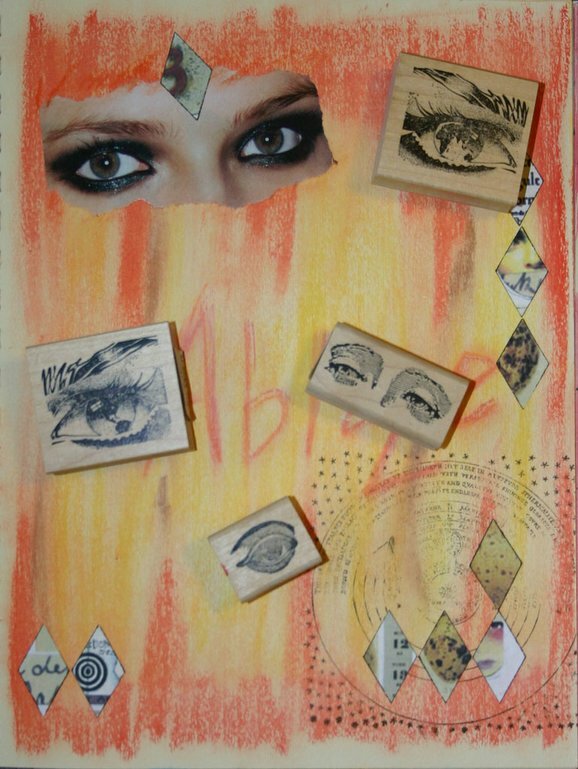 Earlier this week, when I read the theme for Studio Friday "I'm All Eyes", I felt challenged. No ideas came to me. Until I woke up this morning and remembered that my post to last weeks SF said that all I had to do was open my eyes and I can find inspiration. I was embarrassed that I so quickly forgot what I had just said. So, I opened my eyes, flipped though my art journal, went into my stamp room, gazed and voila, found what to submit. Well, truthfully, there isn't much to explain. I created the layout in my art journal using oil pastels and a magazine cut out and collage sheets from Teesha Moore (I'm buying more right after I finish this post!!). And just a few of my "All About Eyes" rubber stamps. If you enlarge the image, you'll notice that top most and the left most stamps have the earth for the pupils. Love that. Your eye stamps are very cool. Great job with this weeks theme! I love your creativity, Madretz! And btw, I'm in Germany right now so NO, it's NOT that cold in Atlanta! In fact, I think it was in the 70s yesterday! I live in Atlanta but am in Germany almost every month for two weeks at a time, helping Donica with house chores while she works. That's where we are till the 18th. I love how you describe not thinking of anything and then remembering your SF post from last week. I do that kind of thing all the time. Thanks for sharing the eyes - those stamps with the earth in the pupil are really neat! I read some of your other posts and really enjoyed your blog. Such a beautiful collage! Awesome eyes you have there!! Wow this is very cool! The earth eyes are neat! I must say I love the background you created - wonderful colors! What does it say on the sheet under the cutouts? Is it a word or just letters? Very cool. Cate - it says "Ablaze". The colors I chose and the smokey eyes made me think "eyes ablaze in fire". Thank you so much for the welcome and for the encouraging words on my first time with SF. So I'm thinking our interests are similar because not only did your entry contains stamps, but you also referenced Teesha Moore...I am a HUGE fan! The Mona Lisa stamp is a Stampers Anonymous and it also says Tim Holtz Collection on it. I bought it at a local store here in Beaverton, OR called Peddler's Pack. Cheers! I look forward to hanging out with SF next week! It's cool what happens when you open your eyes to the inspiration that's all around you! Madretz, I added a link to your site from mine. Hope that's ok.